Sticky adventures follow Paddington Bear wherever he goes. Yet his tales always have a happy ending. 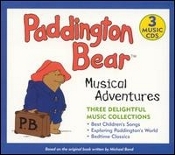 This delightful 3 CD music collection of fun-filled children's songs, instrumentals of his everyday adventures and artfully blended classics enhance the humorous predicaments of this lovable bear. So get ready for an exciting journey and don't forget the marmalade! Based on the original book written by Michael Bond.